The right sportcoat is the perfect mix of casual, formal, and a hint of ruggedness that will prove to be one of the most versatile items in your closet. Most people use the terms blazer and sportcoat interchangeably, but they are traditionally different. 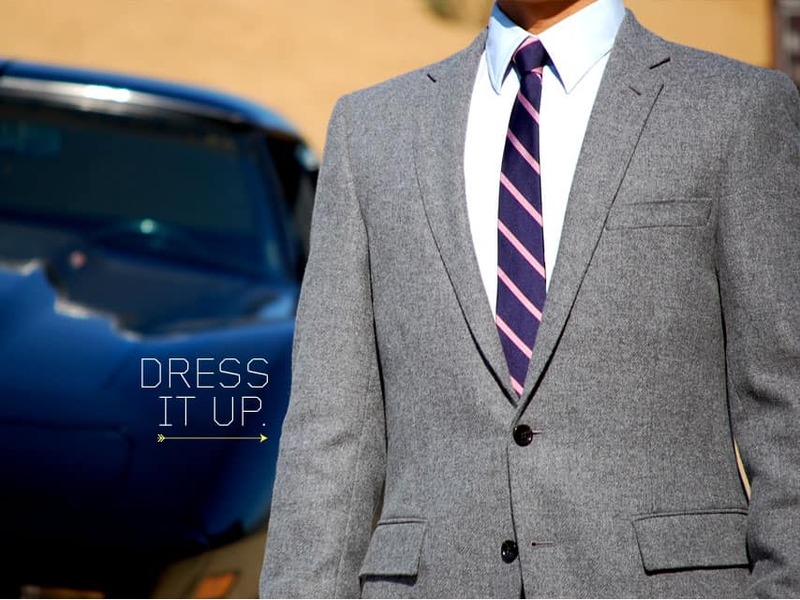 Sportcoats, while similar in shape, are typically made of thicker, textured fabrics like tweed. Many guys wear blazers to dress up whatever they're wearing. I find the right sportcoat acts more like a neutral modifier: It makes whatever you're wearing look better, without tipping you in a more dressy direction. A sportcoat looks great with a shirt and tie for your business lunch, but it also adds style to a casual shirt or sweater without making it look like you're overdressed. 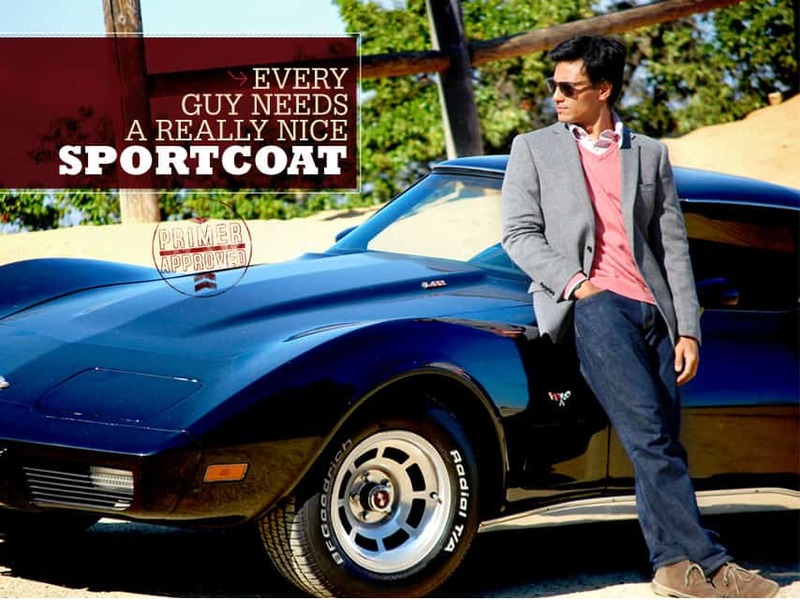 Sportcoats come from an era when men participated in outdoor sporting like hunting, fishing, and horseback riding. These coats were worn casually, and their thickness was used for warmth. Blazers are traditionally more formal on the jacket scale. Sportcoats are the least formal, then blazers, then suit jackets. All of this gets very hazy with the casual dress of today; the real importance is that they're made of different fabrics with different textures. The texture of a sportcoat lends to its neutrality. Ever try wearing a suit jacket casually? You've probably found the smooth wool of your suit looks out of place. The texture of a sportcoat also mixes well with other textured items. Check out Look 3, where we paired the sportcoat with a flannel shirt. Try doing that with most blazers and you'll look like a lumberjack with a GQ subscription. Sportcoats come in lots of different colors and patterns. 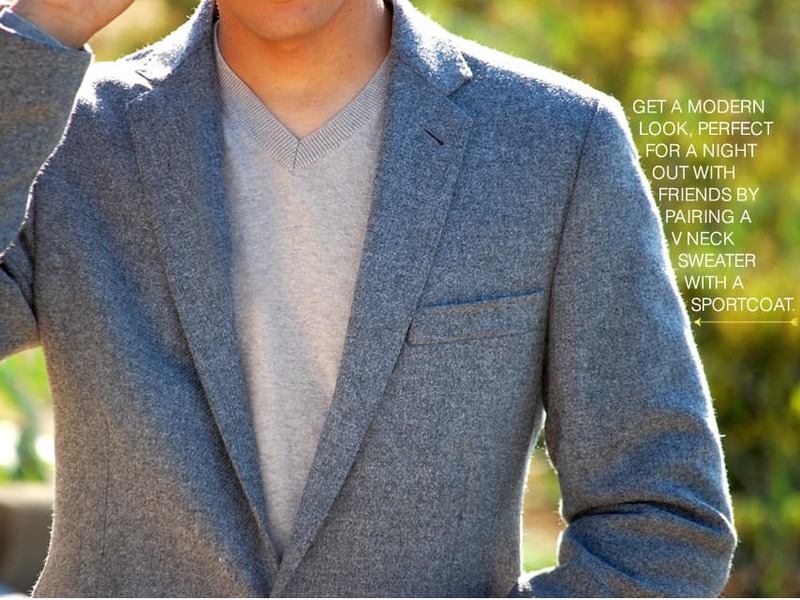 For your first, I'd recommend picking up a solid color, like this gray sportcoat from J.Crew. Gray is a really versatile color that goes well with practically every other color, and conforms with different shoe shades and the patterns of your ties or shirts. The right sportcoat can be worn much like any other outerwear jacket. Throw it over a button up shirt with jeans and you'll look smart without being out of place. Wear it with chinos and some suede bucks and you'll be dressed perfectly for that fancy dinner with your girlfriend, without looking like a teenage kid who's trying too hard. I have always wanted a sport coat and now is the chance to get one, I think. I also need to shop more at Land’s End Canvas, I love everything you guys pick up from there. Thanks for the clarification on blazer vs. sportcoat. Ashamed to say I did not know the difference. I’ve had my eye on the J. Crew sportcoat featured in this post but haven’t pulled the trigger yet. Would you rate is as being worth the money? Daniel, Glad it helped! As for the J.Crew sportcoat, it’s really nice and will last you awhile. It all comes down to budget, $300 for anything can be too much sometimes. I doubt you’d find a similar quality sportcoat elsewhere for less. Yeah, I hear ya. I’d rather spend $300 on one good thing, than $100 each on three pieces of crap that I’ll just give away in six months. If you go with a white shirt and tie…. what pants would you wear? You could go with dark, straight leg jeans, the right chinos, or something like Express’s producer pant in a dark charcoal. Some guys looks good wearing any type of clothing but other guys just have specific clothes that will match their style, this coats are perfectly suited for guys working on an office they will look more appealing. Heads up, that sport coat is now on final sale at J. Crew and is $160.99 after promo code MUSTHAVE. I really like the sportcoat you have chosen to showcase in this post. However, the $278 price is a little steep for me. Do you have any more affordable options you’d recommend that look just as sharp? Thanks for your response. Can I wear that one to office on Friday?